I should probably break this post down to two separate posts, but 'eh, I figured, why not just put them both in one. 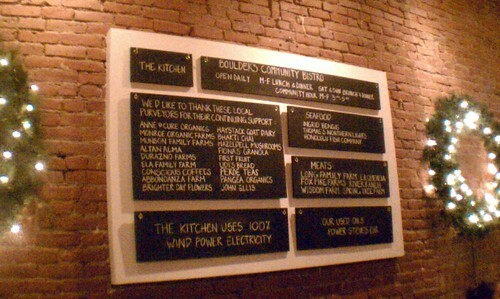 Anyway, we found ourselves in Boulder for a couple of nights for dinner and we picked Foolish Craig's & The Kitchen. 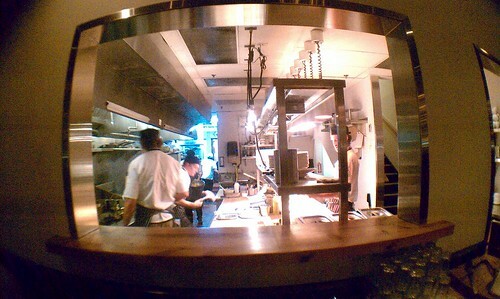 Listed as Trip Advisor's #15 pick in Boulder, we didn't know that going in. Actually, we were in search of Frasca, but when we walked up and noticed it was several courses, prixe fixe and we had a very hungry toddler on our hands, we opted for something else. We gambled and walked up a bit on Pearl and happened upon Foolish Craig's. We weren't really in the mood for just a burger, but the family in the window were indulging in just that. When we walked in the, place looked like someone had thrown a roof over what was once an alley. It was filled with lots of local artwork and the staff was every bit as eclectic as their art. This was definitely Boulder flair. We were warmly greeted with a heavy dose of laidbackness and unpretension. 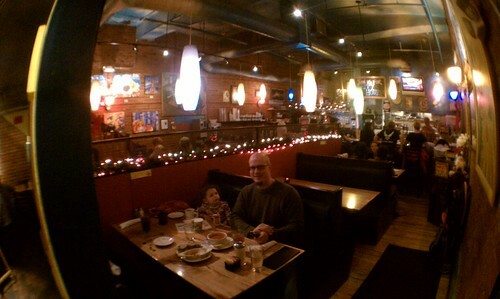 We were seated in a large booth where Mari was free to roam as she pleased. Then, we were handed the menus. Seriously, this place made me immediately think of someone that our Primo would own. The look and feel is COMPLETELY laid back. The food is not to be messed with. It isn't just a burger joint. No way! This is some good food. 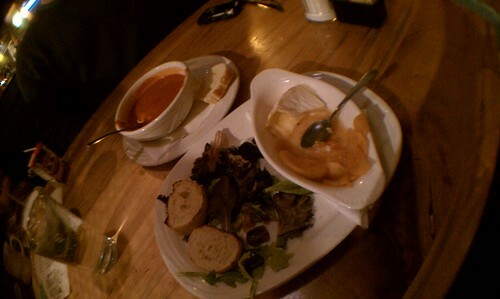 To start, smoked tomato soup, warm brie with caramelized pears and apples. Both were served with baguettes. 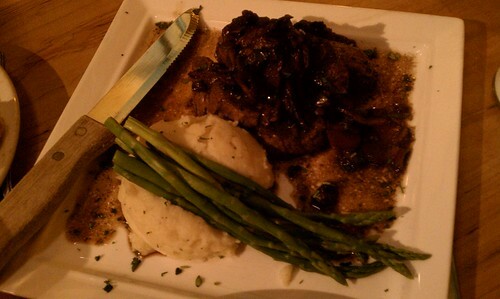 For entrees, I had the beef medallions with mashed potatoes, asparagus, and a mushroom sauce. The beef pieces were cooked to order, but were unfortunately a bit too chewy. The mashed potatoes, while fresh, were garlic-y, but that's it. Too dry. I did like the asparagus and the sauce, though. 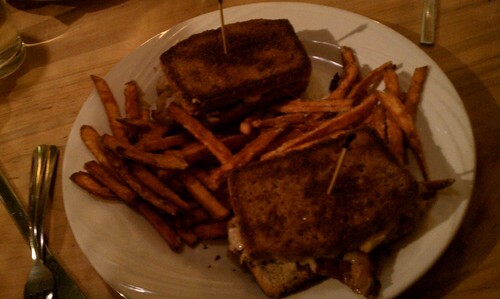 Don had the Reuben with sweet potato fries. The rye bread is made in house. So is the corned beef, thousand island dressing, and sauerkraut. The bread was over toasted, and the sandwich didn't have any pop. Of course, when Don makes these at home, he uses the Texas Twisted thousand island dressing which I think has a hint of pepper. He also adds mustard to the sandwich too. I prefer his, but this was pretty good. The fries, oh wow...those fries were heavenly! Perfectly crisp on the outside, and proper fry texture on the inside. We ordered simple Kraft mac and cheese with steamed broccoli, but all she wanted was the soup. ha ha! This is a great family restaurant with really great food and I didn't get a photo of it, but I ordered chocolate mousse that had been fresh made and it was divine! 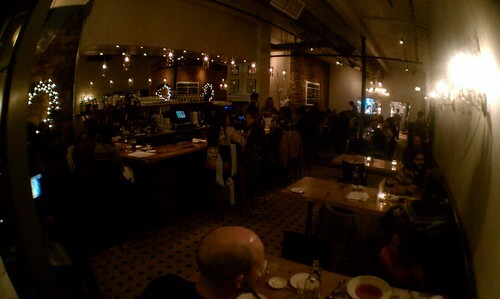 If you are in Boulder and want a night out with good food and don't have a sitter, well definitely try out Foolish Craig's. 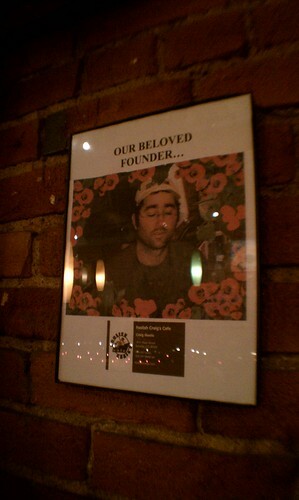 Hopefully we'll get to go back to Boulder some day and this will still be there. Listed as Trip Advisor's #5 spot, I found this spot based on a recommendation from a colleague that was from the area and she was in the training class I was attending. Side note, we parked a bit away from it so we could walk through the pedestrian mall specifically to check out two shops that we found intriguing. Unfortunately, those two shops closed early, well, early for me, and we didn't get to see them. Seriously, one closed at 4 and the other closed at 7. It was 7:05 when we walked by. Bummer. Anyway, on to the shop. We sat at the table on the website. We didn't partake in the community dinner. The decoration was spare and clean. It was very simple and classic cafe dining. 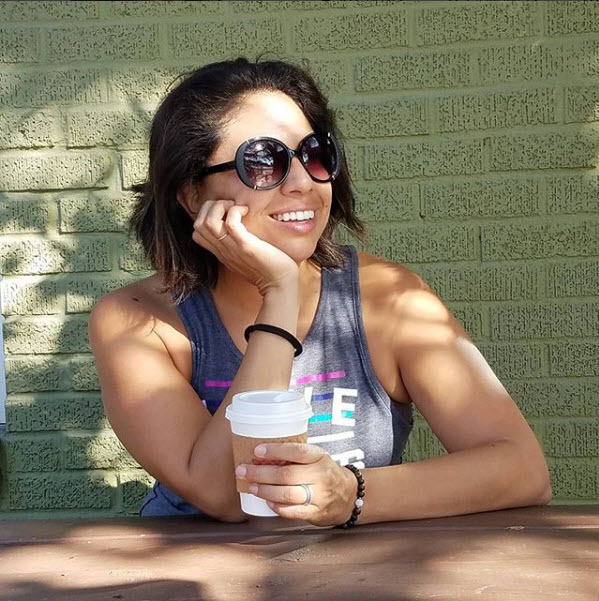 The hostess was friendly, the server professional, the busboy/bread guy was professional, and in the dining shop, it was filled with all walks of life from Boulder, but Mari was the only toddler. The server brought out some crayons and a bad print out of their menu for her to color. She happily scribbled along while we chose what to eat. Since this was our final night, Don and I wanted to make it a special date night. Well, as special as we could. The ambiance was very romantic, and so we indulged in drinks. 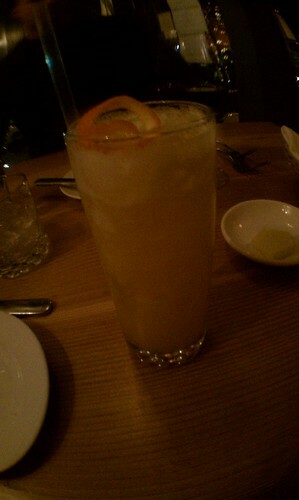 This fizzy drink had orange juice, grenadine, pineapple juice, and some other stuff that I don't remember. It was good, though. Don enjoyed a nice wine. 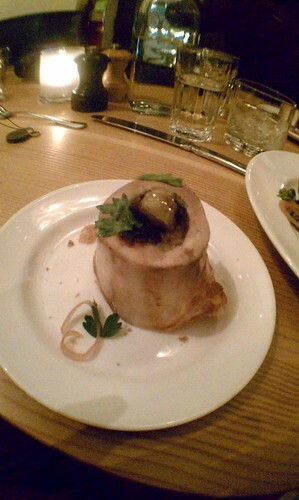 To start, I ordered the marrow. Holy moly, to have marrow on the menu is heaven to me. 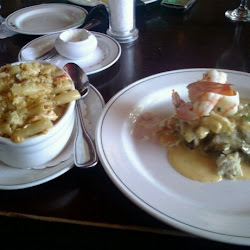 To have it served and be delicious is a special treat! I realize marrow is a specific taste for people, and if you are totally destroyed by the thought of eating it, well, more for me. 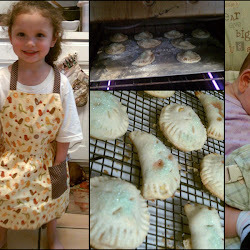 Mari had to go to the bathroom and on our way, we passed the kitchen. I was happy to see that it was like an open kitchen, so I asked for permission if I could grab their photo and they happily smiled and encouraged me to. By the way, the bathroom was immaculate and they had fresh hand towels to dry our hands. 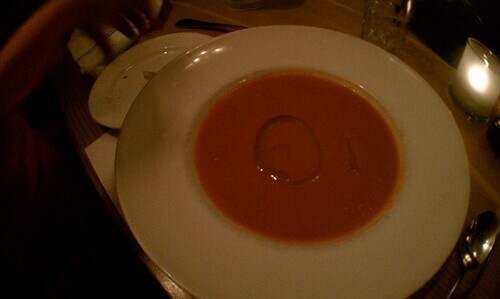 Once again, we ordered the soup for Mari because she had enjoyed it so much the night before. She ate this entire bowl of soup by herself. We later learned that it is sold at Whole Foods. Personally, when I tasted it, I liked it, but I thought the flavor at Foolish Craig's had more punch. 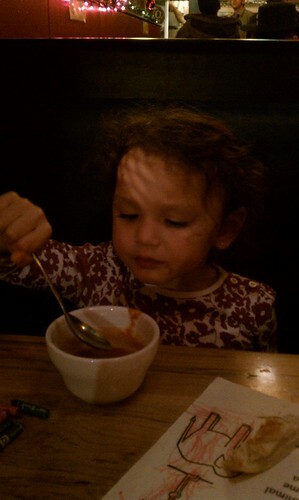 Mari, clearly liked it, though, so now we're adding tomato soup to her list of growing favorites. 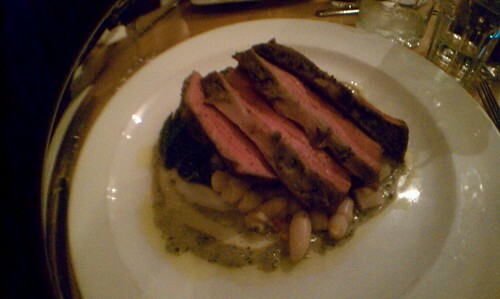 Colorado lamb sirloin oven roasted with braised cannelini beans, sauteed lacinato kale and anchoyade...the lamb, much too tough and dry. The kale and anchoyade was phenomenal. The beans...meh. 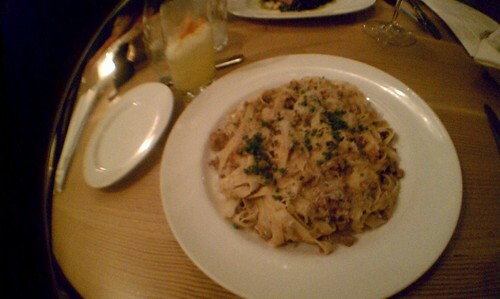 House Tagliatelle alla Bolognese, beef, pork, lamb, tomatoes, and cream...this dish is more up my alley, except I desperately wanted more tomatoes. It was good, but just a tad bit too dry. All in all, this was a nice place and definitely some place to go on a date, but maybe not on a family date with a toddler. The food was good, but just not as satisfying as Foolish Craig's. I could see why it made the top 5 list of Boulder, but I just wasn't feeling it after the appetizer. By that point, I didn't even want to eat dessert (I know, right!). I would still recommend it to couples, though!